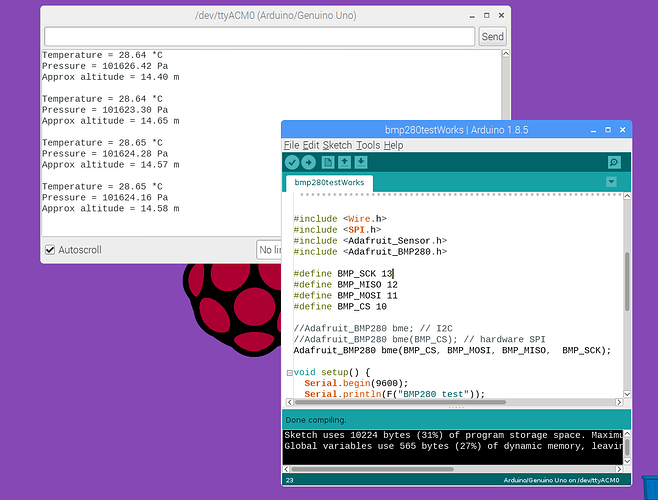 Having been frustrated over the last month or so with inaccurate weather forecasts in the mainstream media, I decided to experiment with the MAKERbuino to see if I could create an Arduino-based weather-station that I could carry around in my pocket. I am hoping that this can give me a more up-to-date picture of the weather from where I actually would be at the time. The MAKERbuino is an ideal platform for this. It is self-contained, has it’s own power supply, display and several options to connect external sensors. I have decided to go with the Bosch BME280 3-in-one sensor for temperature, humidity and barometric pressure, available in SPI or I2C versions (or combined, in my case). They generally cost less than €5.00 here in Europe. 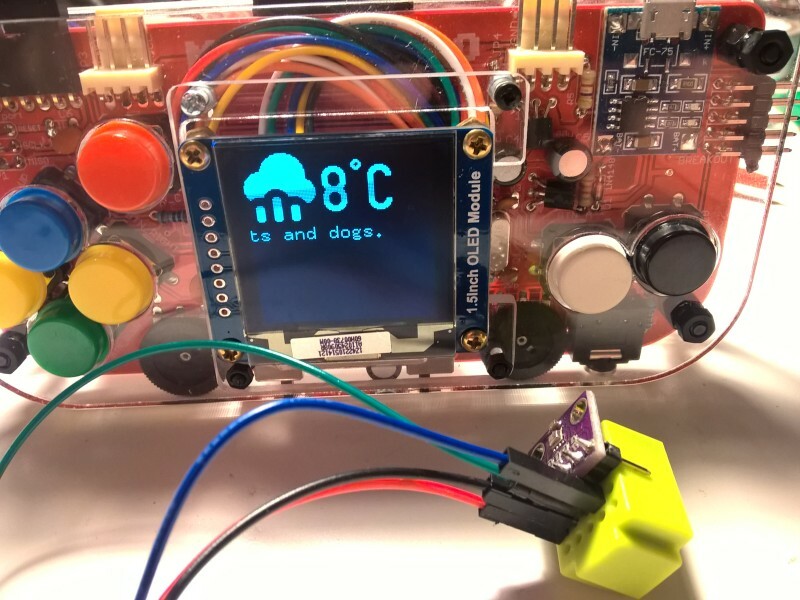 I have replaced the Nokia screen with a more “in-your-face” OLED display (see my other post), and the author of the appropriate Arduino OLED libraries has made a few weather display examples available on his GITHUB. These will be my starting point, together maybe with the Adafruit library for the sensor breakout. I will be using a mini (5x5) breadboard which I will attach to the MAKERbuino case, keeping everything as compact as possible (in picture below). Cool, keep us informed of your progress. I’m very interested and would adapt it with the new backpack of the Meta (The big sister of the Gamebuino who is the base console for wich is the mother console (not to build yourself) of the Makerbuino. Thanks for your explain and please continue to inform us about your progress. Thanks for your interest. I will certainly report on my experiments with the MAKERbuino. I have hit a small problem connecting my weather sensor to the MAKERbuino. I bought what should have been the popular Bme280 chip, with the code GY-BME/P-280 on the breakout board. It seems that others have had trouble using this particular chip with the Arduino - it is just not identified. Connected to a regular Arduino and using a Bmp280 library (that is, without a humidity sensor), it works as expected, but only when I connect all 6 pins and use a software SPI setup (see photo). My supplier states that it can work with either I2C or SPI, but unfortunately that seems not to be the case. When I connect my weather sensor to the MAKERbuino using I2C, the chip is not recognised - the same as with my regular Arduino Uno. Aiming to connect my sensor using SPI, I looked on the MAKERbuino circuits for the Arduino pin D10 to connect to the CSB pin on my sensor. Unfortunately this is being used for the SD Card reader (SD_CS), and not exposed on any of the breakout connections. From the circuit diagram, pin D5 on the MAKERbuino seems to be unused, but is not available for use externally. Has anyone any information on how to make an SPI connection to the MAKERbuino without having to surgically dig open the insides? A test sketch run on a standard Uno with an SPI connection to my sensor - using my Raspberry Pi. I think the MAKERbuino has potential as a useful platform for coding experiments, but the lack of basic documentation is frustrating. For instance, the MAKERbuino GitHub repository simply states “This repository is empty”. I see no use in trying to sift through the code for “legacy” gamebuino when I want to experiment using my “Inventor’s Kit” version of the MAKERbuino. All help welcome - thanks. 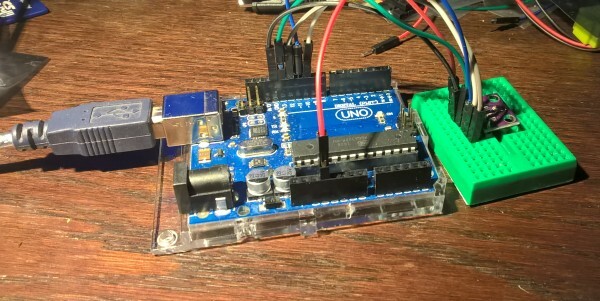 I’ve had success using a different Arduino library and with my sensor connected to the I2C port of the MAKERbuino (GND, VCC, SDA, SCL). Although for the Bme280, it recognises mine as a Bmp280 and supplies data for barometric pressure and temperature. Next - formatting and sending the data to the display (using the Nokia5110 for now). I’ll be using Adafruit’s library without the gamebuino software. I could not find information about the VCC voltage on the GAMEbuino I2C port, but tested with my Voltmeter it read close enough to 3.3V. Important because my sensor board takes only 1.71 - 3.6V.